Calamari dribbling the ball for the Maroons. Fourth-year Mia Calamari finished her collegiate soccer career this past season, leaving a legacy on and off the field (and a few school records) along the way. Calamari ended her final year with another stellar season and a plethora of awards, including USC First Team All-American, D3soccer.com First Team All-American, NCAA All-Tournament Team, USC First Team All-Region, First Team All-UAA, USC First Team Scholar All-American, First Team Scholar All-Region, twice UAA Athlete of the Week, and UAA All-Academic Team. Calamari posted 30 total points on the season, as well as two game-winning goals. Since her second-year, Calamari has been a constant for the team in the midfield, starting the past 67 games for the Maroons over the past three season, plus 16 out of 21 in her first year. Over her 88 total games played, Calamari totaled 16 goals, a .431 shot-on-goal percentage, and 90 points, putting her at third all-time on the University of Chicago records list. Calamari is a facilitator. 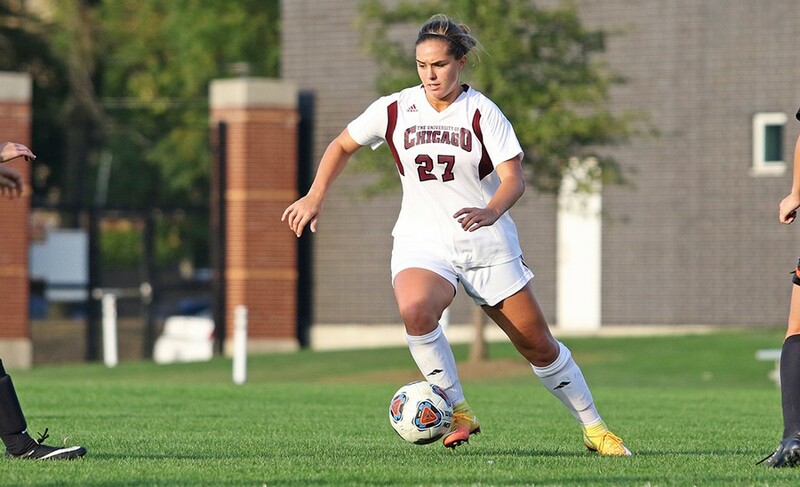 From the very beginning of her career, Calamari’s adept vision and accurate passing skills have set her teammates up for numerous goals, helping the Maroons to a second-place finish in the NCAA Division III Championship in her fourth year. Throughout her time on the soccer team, Calamari pushed both her teammates and herself to continue getting better. Striving to improve each year, Calamari broke UChicago’s assists on the season record three times, two of which she set herself. This past season, Calamari set a new school record for assists with a total of 18, which ranked second in all of DIII. Calamari smashed her previous single-season record of 15 assists that she set in 2015, putting her career total at 58 assists, the all-time school record. Calamari’s talent was also recognized across the soccer community, as she came in second in a poll for which DIII soccer player is best at assists with a whopping 36,362 votes. Outside of being a star on the soccer field, Calamari was heavily involved on campus and in the surrounding community. Calamari volunteered as a mentor for MoneyThink, a non-profit organization that aims to increase the financial capability of American youth by training college volunteers to serve as financial mentors for low-income high school students. In her free time, Calamari helped others pursue their soccer dreams, working as a soccer coach at the Johnson School of Excellence and the UChicago Lab Schools. Calamari is also a member of Delta Gamma. Having majored in public policy, Calamari will be working at Chapin Hall, a policy research organization focused on youth and family policy, as a research and communications project assistant. Calamari will graduate and leave Hyde Park this June after helping lead the women’s soccer team to national prominence and a dominant four-year stretch. Her presence will surely be missed by the team next year.